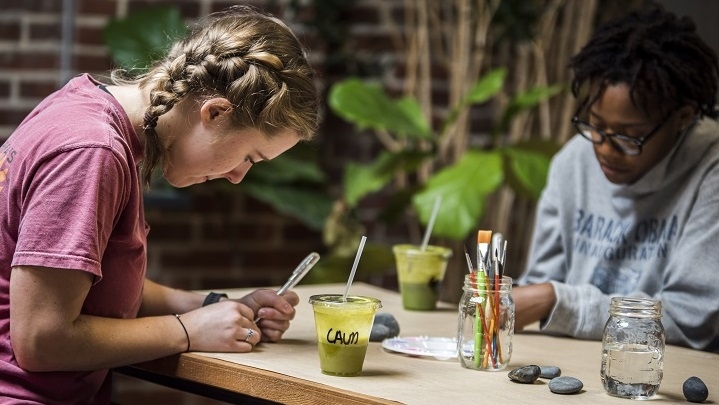 VCU students practice one of the Artfulness activities, developed by Molly Ransone, drawing mandalas on rocks and other found objects, while also meditating. Burnout happens in a lot of workplaces, from the corporate world to non-profits to college campuses. An effort at Virginia Commonwealth University aims to reduce stress and promote well-being by combining mindfulness and art. Catherine Komp has more for Virginia Currents. Learn More: Explore the Artfulness sessions and follow other projects developed by VCU's ALT Lab. Before George Deeb joined a team of physicians climbing Mount Denali, he took a mindfulness course. The meditation tools came in handy when they were tent-bound for five days during a storm. George Deeb: The mind has a natural tendency to kind of ruminate with these negative thought patterns and mindfulness is helpful at breaking those so if you’re stuck up at 17,500 feet and you may start to have thoughts about I’m not good enough, I shouldn’t be here, I’m not going to make it, and in order to break the cycles of those thoughts, it’s helpful to do mindfulness-based stress reduction. As a surgeon at the VCU School of Dentistry, George Deeb also saw stress and burnout in students and other faculty. Along with Patricia Kinser, he started teaching a course: Mindfulness Practices for Healthcare Providers. Deeb: For teachers and any practitioners it's been proven to reduce burnout in physicians which is present in approximately 60% of practitioners and it gives people a greater sense of well-being in their profession so that they might enjoy their profession more and we find out that those care providers that aren't as burned out have a lot more empathy for patients. Burnout doesn’t just happen in the medical fields. A new initiative, co-created by Deeb, artist Arnold Kemp and other VCU faculty and staff aims to reach more people on campus, and eventually the larger community. It’s called Artfulness and it fuses mindfulness, meditation and art practice. Launched this Fall, Artfulness is self-guided and web-based, designed to be something you can do anywhere, at home, while traveling, or taking a break at work. Molly Ransone is Assistant Director of Learning Media Innovation at VCU and is the Founder and Creative Lead of Artfulness. Molly Ransone: The first [session] is “Beginning Practice” and that one we’re just introducing this idea that you’re not going to make something one time and feel something, that it really is about creating a practice and what means, and carving out time for yourself and the repetition. Each session begins with a video that explores the intersection between mindfulness, expression and creativity. Deeb and Kemp host the first one. Then, you can listen to guided meditations and be led through breathing exercises. Next, you pick from one of five art activities developed by VCU faculty across disciplines. There’s music, drawing, dance, photography and writing. And no background in art required. Lea Marshall is VCU Assistant Chair of Dance and Choreography. Her activity falls under the writing category. It’s a process called erasure poetry. Lea Marshall: You can approach it visually, you can approach it sonically, you can approach it a variety of ways that don’t have to do with thinking of yourself as writing. Marshall explains how it works. You take a piece of text, a page from a newspaper, magazine, a novel, poem, even a cookbook. Get a thick marker and start blocking out the text you don’t want. The words or phrases you keep blend into something completely new. Marshall: In the way that most creative endeavors do, it concentrates your attention in a way where you can kind of slip into the zone, where you forget what time it is. It’s very absorbing to take a text out of its context and turn into something else and speak in a completely different voice. I bring a page torn from a 1970’s travel book, describing Hawaii’s Waimea Canyon. Marshall: We’re going to mark out with our sharpie pens the words that are not part of the poem that we want to make. There’s about 150 words to work with. Marshall starts in the middle. If you have a morning and afternoon, flee across the tropic sky. Tones to capture: delicate blues and greens, rose. The blues and greens, bronze and gold. The colors began as a crack in the dome, sculpted. Erasure Poetry and other artfulness activities don’t require you to create something from a blank page. That would be too stressful, says project founder Molly Ransone. They’re designed to use everyday objects and tap into that place that is relaxing, engaging. That puts you in the present, encouraging reflection and creative expression. Ransone: For us with Artfulness we really wanted to make sure that people knew that art practice isn’t only mindfulness for artists. In fact, we really want it to be art for everyone. Artfulness fits into other efforts to promote emotional health and well-being at VCU including at COBE, College of Behavioral and Emotional Health Institute. Ransone: It’s been really great to see since even sharing this idea of Artfulness with various people at VCU just how much support we’ve gotten and I do think that it’s because there already have been some amazing people who have been paving the way for that culture shift to happen. And we’re also seeing a culture shift across our country with people really seeing the benefits that things like this can have for students. As “Artfulness” is a new concept, VCU will conduct research to measure the impact. The Artfulness sessions will be used in a freshman level student success class and are available online for anyone to use. The project’s creators say the curriculum has potential for other environments, including non-profits, corporate settings and schools. For Virginia Currents, I’m Catherine Komp, WCVE News. Thanks to VCU/Artfulness for providing photos for this story.